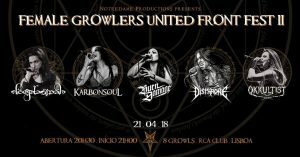 O “Female Growlers United front Fest” está de volta! A consumo mínimo para esta grande noite custa apenas 7,99€ com os bilhetes à venda no próprio dia na bilheteira do RCA Club. Formed in 1997 under the name of Systematic Collision, after many line-up changes and some demo-tapes recorded, they changed name to Neoplasmah and found their definite line-up in late 2002. Dozens and dozens of gigs somewhere all over Portugal were done and in 2003 they started to record their 1st album “Sidereal Passage”. Unfortunately during the recording sessions some line-up changes had to be done and respective parts needed to be re-recorded. With a final and stable line-up (which remains untouchable untill today) again dozens of gigs were done all over the country, with presence in many well known festivals, and the album was unleashed during 2004 by the label Nebula Records/Dark Music Production. During 2005 the band entered a hiatus of 7 years and returned again in 2012 to full activity. The band started the recordings for their 2nd album in February and played live a couple of times during 2012. In early November they finished the recordings. 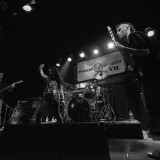 RStein – Guitar; Muffy – vocals; Rvid – Bass & Sir Nightfall – Drums. KARBONSOUL is a Portuguese death metal band (Sintra) with doom and dark/black metal influences. Formed in March 2007, initially characterized as a gothic metal project; the initial sound was defined as more melodic with melancholic environments. Over the years, KARBONSOUL began to change their musical style, in a natural way to a heavier and obscure metal. Leader and guitarist RStein conceived the whole project. It all started during a tour with VS777 when RStein (ex-VS777) met Muffy in Elvas, her hometown. The invitation was accepted for lead vocalist. For this project was also invited Hellfish for drummer. In following to complete the quartet, Rvid was invited to join the band as bassist. The band recorded the first songs, “The Void of Love” and “Tears of Agony” which served as the band’s performance around the Internet. Year dedicated to music composition, rehearsals and preparation, turning an individual project to a band. KARBONSOUL had the opportunity to play live on some heaviest events on the national underground, in which we highlight the openings for bands like KATHAARSYS (Spain); WHY ANGELS FALL; MOURNING LENORE, DARKSIDE OF INNOCENCE and some festival appearances such as Dark Summer Fest with DESIRE, ENTROPIA and INVOKE. In early 2010, KARBONSOUL recorded two songs – “Frozen Bodies” (videoclip) and “The Siren”, together with three other Portuguese bands (ENTROPIA, INCOMING CHAOS and INVOKE), which are part of the Split CD Concilium 13 released by UNIÃO METÁLICA. This work was heavily promoted during the year with the tour of the same name – Concilium 13 Tour through some gigs from north to south of Portugal. Highlighting the opening for old school Portuguese R.A.M.P. in Subversion Tour, opening two dates in Portugal for KELLS (France) and presence at national festivals like Gaia em Peso and Street War Fest, with opening for DECAYED. At the end of the first part of the tour, drummer Hellfish left the project for personal reasons. In September, the drummer Sir Nightfall (ex NOCTURNAL REVERIES) joined the band. A new era was begun for the band, becoming increasingly more intense, brutal and dynamic. In April, KARBONSOUL started recording the EP “3LOGY”. In August, the song “Bleeding Sorrow” enters the compilation Light Bearers, released by INFEKTION MAGAZINE. This compilation brought together some of the best metal bands in the national underground. In December, the quartet stepped on the stage in Évora with BORDERLANDS, GENNOMA and E.D.G.E., and played at festival 2nd Cameraman Metalfest in Moita with ATTICK DEMONS and ACID LIZARD. The end of 2012 and the year 2013 were very troubled times for KARBONSOUL. Health problems of two band members and personal/professional problems have caused almost a break. Still, with much effort, the band remained active in the studio, working on EP 3Logy and composing new songs. In January, KARBONSOUL return to Évora, this time, shared the stage with thrashers CONTRADICTION (Germany) and NUKLEAR INFEKTION. On December 6th, KARBONSOUL make the opening for old school Portuguese masters SACRED SIN, in Lisbon, where Muffy participates as a guest musician on the tour Sacred Sin + Friends with the cover “Arise” (SEPULTURA). In late December, it was completed the mastering of the EP. This work was recorded and mixed in the FATSOUND PRODUCTIONS studios (Sintra), produced by Mário Rodrigues, guitarist and producer of KARBONSOUL. Three songs and a bonus track compose the EP 3Logy: “Bleeding Sorrow”, “Construction through Destruction”, “Decadent Empire” and “3LGYOde”. This work marked the end of a chapter, the beginning of a new era in the music of KARBONSOUL and reflects the last three years of the band. On January 25th, was released the digital format of the EP 3Logy and available on digital stores: iTunes, Amazon, Bandcamp, and for free listening on ReverbNation, Rdio, Soundcloud, Spotify and on Tradiio. On April 5th, KARBONSOUL played at Hellvas Metalfest II with 13 AFTER, EXTREME RETALIATION, KAPITALISTAS PODRIDÃO and grinders RDB. On June 7th, the band played at festival Hell in Sintra 2014 with INVOKE, DIABOLICAL MENTAL STATE, GENNOMA and MY ENCHANTMENT. In this day, it’s also released a physical format of the EP 3Logy. A Digipack Limited Edition: Art Booklet + Lyrics + Bonus Track. Artwork was made by vocalist and designer, Muffy. On July 1st, the song “Decadent Empire” enters the compilation 13 Portuguese Metal Compilation vol. III – January/ June 2014, released by 13 METAL COMPILATION. This compilation brought together 13 national bands with releases in the first half of 2014. Working in some loud new stuff!! Burning stages and creating damage since 2008 across Portugal with a lot of portuguese good bands \m/ we live to provide good speed heavy spirit gigs to you all, as time went by we switched vocals in 2011 and shape our way to work create and play angry and powerfull music!! We release our first EP “Reborn” in 2013 and we have been promoting it since by in metal festivals, night club’s, undergound bar’s, indoor rotten party’s, etc…We are currently working on our first album and shaping ourselves to be full power again !! We have two new members in our team because the brothers Nuno & Silvia left the band due to personal reasons. Nevertheless we´re getting tight and stronger and we’re working on a full speed groove metal album !! Stay tuned, fresh news are coming !! No one is left behind !!! Banda de Crust/D-beat do Seixal, Margem Sul. The beginnings of this project come from the neurons of guitarist Daniel Pereira (Bruma Obscura, ex-Undersave), who wanted to form a Crust band with some Metal influences. He grabbed the guitar and started writing songs. Then called Pedro Santos, his cousin, a bassist in idle who knew the idea of Daniel to form a band. Challenged Tiago Sousa (Inquisitor; Midnight Priest) to join them in the drums. He grabbed the drumsticks and said “Let’s do it!!”. The rehearsals began at the month of November 2011. Yet still lacked an element … Vocals. They remembered to call Carina Domingues to do some screaming into the microphone. She had already heard about this project through these guys, but who nevertheless, did not expect the invitation, in which she accepted without hesitation. Now Carina would be in charge of vocalizations as well as the lyrics. The first rehearsal with the four elements occurred in mid-February / March 2012. After several afternoons, the songs became more solid and with the intended feeling. During the Summer we made simple recordings in the garage and, despite the recording quality wasn’t what we intended, given the conditions, resulted very well. And so we made known Disthrone, creating a Facebook profile that nowadays is an excellent tool to spread the word. Daniel and Tiago designed a logo. The first song that was released online, “Mistress Of Evil”, is an ode to the “Blood Countess” Elizabeth Bathory. Then started the gigs … The first took place at FLUL on September 30, an event organized by No Borders – DIY Booking. This was followed by other concerts particularly Side B, again in FLUL, Caldas da Rainha, Anjos, Coimbra, Porto etc … Each gig, each chaos! The first demo “Anti-System” came out at May 2013 in tape format with 5 tracks. Following the release, more concerts appeared, which resulted in a good promotion to the demo-tape. Very Soon, an EP 7” with 4 original tracks will be released! Basically Disthrone is formed by longtime friends whose enjoy to play aggressive and loud music inspired on chaos! Com muita vontade de mostrar a nossa música, tocar ao vivo, e conhecer novo pessoal!